The R-11 cars were designated R-34 after rebuilding in 1965. The ten R-11 cars were a new technology test train ordered as a prototype for a new fleet for The Second Avenue Subway, which of course never materialized. The new technology included include "precipitron" sterilizing lamps, under-seat heaters, and damper control of fresh and recirculated air through ceiling and under-seat diffusers. The R-11 was the first stainless steel R-type. 15 years later, the Budd Company also built the first production stainless steel fleet, the R-32. 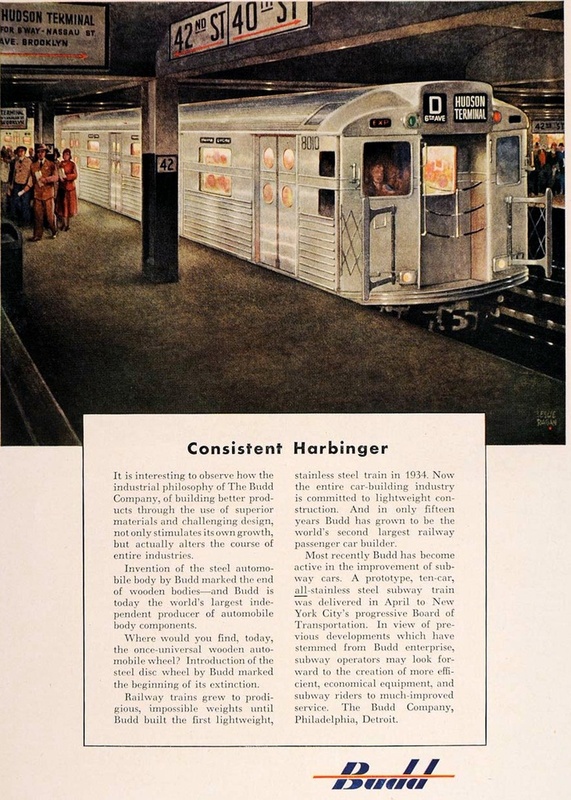 1949 Budd Company advertisement featuring the R-11 cars. There are 196 photos available. 8013 Part of New York Transit Museum collection. Was also damanged in the October 1973 accident which wrecked 8016, but was repaired. Car 8013 had been on static display inoperable but in 2014 was returned to operational status and operated a Transit Museum Nostalgia Train trip on August 3, 2014. 8016 Involved in a yard accident at Coney Island Yard, October 1973.